Thanks to the agricultural revolution and generous farm subsidies, India now grows so much food that the country has a larger grain stockpile than any other, except China. India even exports food to many countries. And yet, 20% of the people are malnourished, which is more than double that of other developing countries like China and Vietnam. Food is presently the biggest killer in the US with 62% of the people diagnosed as clinically obese. India is at the other end of the spectrum. There are more weight loss clinics in the US now than ration shops in India distributing food. India’s population according to the 2010 census, stands at 1.2 billion. An estimated 320 million people out of them go to bed hungry. That’s not all. About 50% of the country’s children below the age of five years are chronically malnourished. But this isn’t because of any food shortage. 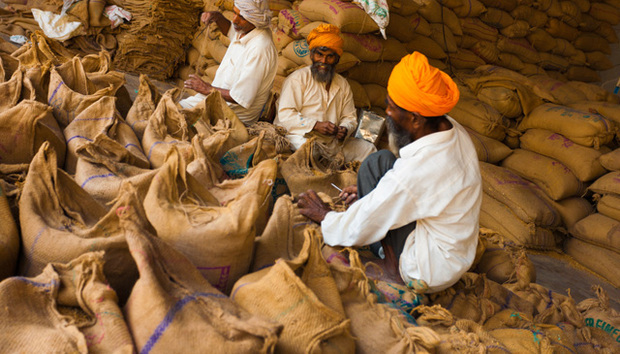 According to late 2012 figures, India produced a surplus of 82.3 million tonnes of crops. The bulk of this however ends up rotting in warehouses that are operated by the Food Corporation of India (FCI) and some private operators. Food growers and distributors will even destroy food sometimes, for fear of killing the sales price. India’s challenge currently is not in producing more food to feed its growing population, but to better manage the storage infrastructure and distribution system. There is a lot of wastage because of lack of modern storage infrastructure like silos. Grain is stored outside wrapped in plastic tarps. This provides inadequate protection from pests and humidity. Crops thus get spoiled even before they can be moved. Transportation infrastructure is a major problem in remote parts of the country as well. Poor road conditions, lack of trucks and tractors, and long distances to city markets make it difficult for farmers to get a fair price. Then there is also the issue of the price falling in bumper crop seasons, even as the cost of reaching markets remains the same. And so, it often becomes uneconomical to harvest in the first place. Crops therefore get left on the field to rot or are deliberately set on fire. India recently passed its Food Security Bill. The aim of this program is to provide five kilograms of subsidized rice, wheat and coarse grains every month to about 70% of India’s 1.2 billion people to alleviate chronic hunger and poverty. It’s an ambitious program, but its success depends heavily on modernizing and revolutionizing India’s food storage infrastructure and supply system. Food security experts have already raised concerns over how successful the bill can be, given the present conditions in the country. The public distribution or rationing system was established in India with a lot of hope about five decades back. It aimed to regulate the distribution of food through ration shops and deliver food subsidies to the poor and hungry. However the system has remained largely inefficient. A lot of food is being siphoned off and sold on the open market at higher prices. But a few states (Orissa and Chhattisgarh) are using technology to clean up delivery. These states are following the recommendations of the former Supreme Court Justice D.P. Wadhwa committee report on food distribution. Using information technology, they have incorporated a completely automated system that ensures minimum human intervention. Technology is used to track goods as they moves from warehouses to ration shops and ultimately to the homes. Vehicles that carry the food have been painted yellow so that consumers can identify them easily and alert the authorities if they are seen unloading food anywhere other than ration shops. The state has also created an electronic database of beneficiaries to replace the haphazard paper system. Text messages are sent to the mobile phones of consumers informing them when a truck to the local ration shop leaves the warehouse. Chhattisgarh has already been able to deliver cheap grain to 90% of its population and emerged as a role model state. Leakages have been reduced to just 4% from a high of 52%. The United Nations’ World Food Program has praised the state’s efforts too. The state of Orissa has also been working on a similar program. In a model project in the remote district of Rayagada, villagers were made to give their fingerprints and have their irises scanned. Villagers are now using these to identify themselves and buy food. This has proved so successful it is going to be rolled out throughout the state soon. Web-based GIS (Geographical Information System), mobile-GIS, and remote sensing are increasingly being used by various agencies to improve the food infrastructure in India. This initiative is being supported by the World Food Program (WFP). GIS is being used in various areas from village level to national level for different sectors including crops, meat, livestock management, pisciculture, milk, fruits, and flowers. It is also being applied for natural resource management for forests and minerals, and to create a water availability index for watershed management and to gauge the irrigation potential. Transportation is a major issue in the country, particularly in the remote areas. The Crop Transportability Index is informing farmers about the nearest markets, the distance, road condition, places where they can fetch the best prices for each type of crop, warehouses in the locality, space status at warehouses, and even the availability of hired transportation. The database is updated live to ensure that the user is getting the latest information. This is helping farmers in many ways. Farmers are reaching the market directly and getting a better price as the intermediaries are removed. And of course they now know the latest prices in each market for all the crops. Wastage is coming down as time to market is reduced, thanks to information on trucks and other modes of transportation, and the latest road conditions. Tapas Ghatak, a geo-physicist, is very hopeful that web and mobile GIS is going to change the food scenario in India. “You are going to see a new India in the next 10-15 years,” he says. Such projects are still at a very basic stage in India though. However, the good news it food management and delivery systems can only improve as technology is used more and more. After all, India is an IT powerhouse, so, it’s only natural that the country uses more of its technological acumen to better manage its food production and distribution. « Xiaomi: The Future of Tech Innovation in China?